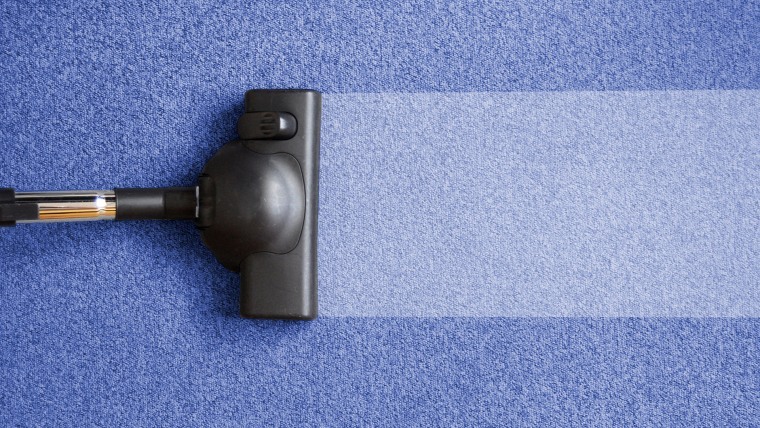 Dirty carpets not only look bad, they can be bad for your health, too. Dirty carpets not only look bad, they’re also loaded with pollutants and grime. These dirt particles act like sandpaper, breaking down carpet fibers every time you walk on them. That’s why it’s important to clean carpets regularly. TODAY Home asked Dean Carter, owner of Carter’s Carpet Restoration in El Dorado Hills, California, to share some of his carpet-cleaning savvy with us. The best way to keep carpets clean is to vacuum them s-l-o-w-l-y, back and forth in repetitive strokes. How slowly? Carter says it should take about 15-20 minutes to properly vacuum a 300-square-foot room. Doing so removes 83 percent of the dry soil in the carpet. In the average household, vacuuming should be done at least twice a week. What's the best vacuum? HGTV stars share their favorites. Sure as the sun rises, there will be times when your carpet needs an emergency cleaning. For larger messes, a DIY steam cleaner works, but do not use the cleaning solution that comes with the steam cleaner, cautions Carter. This leaves behind a soapy residue that will attract dirt. Instead, use water and, if you need a boost, a drop of dish detergent or even a bit of white vinegar. Carter also advises that you take care not to apply too much water when using a DIY steam cleaner. Water left in the carpet can cause mildew and odor. If one of those “emergency” cleanings is due to muddy footprints, Carter offers a time-saving tip. Allow mud to dry first, scrape dried mud off the carpet, then vacuum. Clean remaining stain with steam cleaner or with the water/drop of Dawn solution and a cloth. Blot dry.